On Tuesday, June 9th, the VA published their proposed changes to the Military Disability Ratings for The Eyes. These proposed changes are the third section published so far as part of the VA’s update of the VASRD, which is supposed to be completed by the end of 2016. To date, the ratings for Mental Disorders have been updated and finalized, and the changes to the ratings for the Female Reproductive System have been proposed, but not yet finalized. As each section of the VASRD is updated, the VA will publish their proposed changes and allow for a period during which feedback about the changes can be submitted. We submitted feedback for theFemale Reproductive System changes based on your comments, and we will be doing the same thing for the proposed changes for The Eyes. If you would like for your voice to be heard, please comment on this post or Contact Us directly through our site before Friday July 24th. This is a great opportunity for us to have a chance to make a difference, so please share your thoughts with us. The VA has to consider every comment they receive, so your comments will be heard by the people who actually make the decisions. Once the VA receives all the comments about the proposed changes, they will determine whether or not any additional changes should be made based on the arguments they receive. They will then publish the final version of the new ratings for The Eyes that will go into effect soon after. Once the final version is published, we will get that info out to you as soon as possible. The following are the proposed changes for the ratings of The Eyes. Not everything in the VASRD will be changing, so if something is not discussed below, then it will remain the same as it is now and can be found on our The Eyes page. There are currently two different options for rating Eye conditions: The Visual Impairment Rating System and Incapacitating Episodes. All Eye conditions are rated under one of these two options unless other ratings are specified. Under the proposed changes, these two options will still be available, but with the following adjustments. Currently, when rating a Visual Field condition, the entire visual field must be charted using a Goldmann kinetic perimetry test or its equivalent, and the chart must be included in the medical records. If the chart is not included, then the VA Disability Claim is sent back to the physician. Because this causes so many delays, the VA has decided to change the VASRD to only require the physician to clearly record the information needed to rate a visual field condition. The chart itself is no longer required. Similarly, if any additional testing is done, the physician need only record the results, not include the actual chart of the additional tests. When rating Muscle Dysfunction, the VASRD currently requires a Goldmann kinetic perimetry test to be done and for the chart to be included in the medical records. The proposed changes would allow a Tangent Screen test to be used instead of a Goldmann, and, just like with the Visual Field, the chart itself would not need to be included in the medical records as long as sufficient information needed to rate the condition is recorded in the physician’s notes. Currently, Diseases of the Eye are rated either on the Visual Impairment Rating System or on Incapacitating Episodes, whichever gives the higher rating. This would still be the case under the proposed changes, but the definition and ratings for incapacitating episodes would change. “An 'incapacitating episode' is a period of severe symptoms that requires bed rest and treatment prescribed by a physician. If the physician did not prescribe bed rest, it is not considered an incapacitating episode. Under the proposed changes, the requirement for prescribed bed rest is eliminated, and instead, an “incapacitating episode” is defined as a single visit to a physician for treatment of an active disease. These visits and the treatments and progress of the condition must be thoroughly documented in medical records. If the disease causes additional complications, then the treatment of those complications also qualifies as an incapacitating episode. Examples of qualifying treatments include laser and other surgeries, immunosuppressant medications, injections, etc. A 60% rating is given if there are 10 or more incapacitating episodes per year. A 40% rating is given if there are 7 to 9 incapacitating episodes per year. A 20% rating is given if there are 4 to 6 incapacitating episodes per year, and a 10% rating is given if there are at least 3 incapacitating episodes per year. There are numerous changes to The Eye condition codes. The largest change is in the organization of the various conditions. In the current VASRD, each condition is just listed; there are no groups. We’ve always organized the conditions into different groups on our site, but that was to make our site more user-friendly. With the proposed changes, the VASRD itself will have the conditions organized into various groups in order to make it easier to assign analogous ratings to conditions that do not have their own codes. This really doesn’t affect the ratings at all, just the organization of the conditions. Below, I’ve listed each Eye Code within the categories proposed. If the code and its rating requirements are exactly the same as they are now, then I will simply list the code and link it to the discussion of that code on our site. If, however, there are any changes to the code or it is one of the new codes that has been proposed, I’ll discuss it more thoroughly. The Uveal Tract consists of the iris (the colored part of the eye), the ciliary body (the ciliary muscle that controls the shape of the lens and the ciliary epithelium that creates the gel-like liquid in the eye), and the choroid (the thin layer of connective tissue between the retina and the sclera). The retina lines the back of the eye and converts light into electric pulses that then run along the optic nerve to the brain. 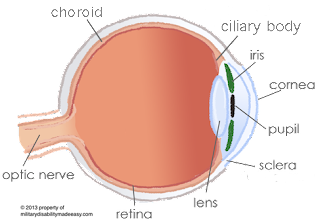 The macula is the part of the retina with the most light receptors that creates the strong central vision, and the vitreous is the gel-like substance that fills the eye. (Current) Code 6011: Any retina condition (scars, atrophy, etc.) not rated in the Diseases of the Eye section is rated under this code. If the condition causes irregular vision with double images, extra large images, extra small images or other irregularities, it is rated 10%. This 10% rating is given whether there is one eye or both eyes affected. The condition can be rated on the Visual Impairment Rating System if it would receive a higher rating. Code 6011: Any retina condition (scars, atrophy, etc.) not listed elsewhere is rated under this code. If the condition causes irregular vision with double images, extra large images, extra small images or other irregularities, it is rated 10%. This 10% rating is given whether there is one eye or both eyes affected. The condition can be rated on the Visual Impairment Rating System or on Incapacitating Episodes if it would receive a higher rating. -NEW- Code 6040: Diabetic retinopathy is any damage to the retina caused by diabetes. It is rated on the Visual Impairment Rating System or on Incapacitating Episodes, whichever gives the higher rating. -NEW- Code 6042: Retinal Dystrophy is the degeneration of the retina over time. The majority of retinal dystrophy cases either develop with age or are genetic, like retinitis pigmentosa. It is rated on the Visual Impairment Rating System or on Incapacitating Episodes, whichever gives the higher rating. Glaucoma is a condition where the optic nerve is damaged due to high fluid pressure in the eye. (Current) Code 6014: Malignant tumors of the eyeball itself are rated under this code. If other things are also affected by the cancer, then each system can be rated separately. So, if the cancer is in the eye and the surrounding skin, then the eye and the skin are each rated separately. Code 6014: Malignant tumors of the eye, eye socket, conjunctiva, eyelids, or lacrimal apparatus are rated under this code. If the cancer also affects other things, like the skin, then they can be rated separately. So, if the cancer is in the eye and the surrounding skin, then the eye and the skin are each rated separately. The lacrimal system is the part of the eye responsible for creating and draining tears and keeping the eye moist. Code 6025: Any condition that affects the production of tears (disorders of the lacrimal apparatus). The cornea is the clear dome that covers the iris and pupil. (Current) Code 6018: All other conjunctivitis conditions are rated under this code. Conjunctivitis can be caused by many things including reactions to chemical exposure and viruses. Viral conjunctivitis is popularly known as “pink eye.” Conjunctivitis is not ratable unless it is chronic—lasts a long time and is not responsive to treatment, or regularly returns despite treatment. Code 6023: Complete loss of eyebrows. Code 6024: Complete loss of eyelashes. Code 6032: Loss of the eyelids. The lens is the part of the eye behind the pupil that focuses the light onto the retina. (Current) Code 6027: A cataract occurs when the crystalline lens becomes cloudy. It can be slightly cloudy or completely block any light from passing through the lens. This condition can be corrected by surgery. If the surgery has not yet been performed, it is rated on the Visual Impairment Rating System. Code 6027: A cataract occurs when the crystalline lens becomes cloudy. It can be slightly cloudy or completely block any light from passing through the lens. This condition can be corrected by surgery. If the surgery has not yet been performed, it is rated on the Visual Impairment Rating System or on Incapacitating Episodes, whichever gives the higher rating. 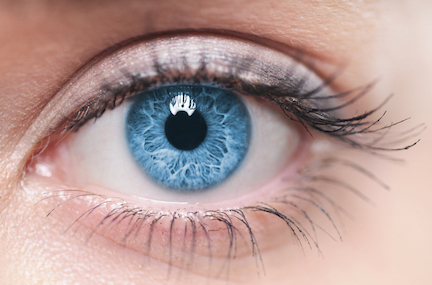 There are two different nerves that interact with the eye. The Optic Nerve takes information from the eye to the brain. The Ophthalmic Nerve takes information from the brain to the eye, controlling the anatomy of the eye. Code 6030: Paralysis of accommodation. -NEW- Code 6046: Post-chiasmal disorders is a broad category that includes many different conditions. The optic chiasm is the part of the brain surrounding the optic nerve. If there is any damage to the brain that affects the eyes, it is rated under this code. This includes any visual problems resulting from TBI, brain infections, degeneration of the brain tissues, etc. Any condition rated under this code is either rated on the Visual Impairment Rating System or on Incapacitating Episodes, whichever provides the higher rating. Those are all of the proposed changes to the ratings for The Eyes. While it might seem like a lot, the main changes are (1) organizational, (2) allowing Incapacitating Episodes, or (3) the addition of a few new codes. Again, let us know your thoughts on these proposed changes. We’ll compile everything we receive into a single report and submit it to the VA. We’ll post that report as soon as it’s submitted. The definition of incapacitating episodes they describe is the same as for back problems. Will the new definition apply to back problems as well, or just eye conditions? That's a good question. The answer at this stage is we don't know. The term "incapacitating episodes" is used very fluidly throughout the VASRD, meaning one thing in relation to one system and another in relation to others. It is true that right now the term means the same thing for both the eyes and the spine, but this does not have to be the case. They are completely different body parts, and so could have the term defined differently. Until the rewrites for the ratings for the spine are published, it is impossible to say whether or not they will be extending this re-definition of incapacitating episodes to the ratings of the spine as well. As soon as they publish those rewrites, we'll let you know. Has there been any talk of Complex Regional Pain Syndrome (CRPS) being added? Not yet. The VA hasn't yet published anything about the section that would cover CRPS, so until it does, it's impossible to say whether or not they are even considering it. I have 10% SC glaucoma, bil eyes due to Agent Orange exposure, I have had over the past 2 years bilateral Trabeculectomy ,one eye with an Aqueous Shunt. My question should the new changes increase my %. Possibly. The only change to the ratings for glaucoma is the additional of Incapacitating Episodes as a rating option. So if you have had enough incapacitating episodes to warrant a higher rating, then it will increase. If not, then it will stay the same. We discuss the Incapacitating Episodes rating system near the top of the blog. While in the service, my color vision went from normal to color blind. I was in Navy as nuclear operator aboard submarine and after having been aboard for two years my color vision was lost. I am frustrated with the VASRD as it is applied--it doesn't take into consideration the career problems that color vision problem has caused and VASRD simply goes back to correctable acuity--where acuity has no relevance to real life problems that color vision problem causes--being able to work on computers and discern color is imperative. You make an interesting argument. In today's society where a great many careers are based on looking at a computer screen, color blindness has more of an impact on daily life than it previously did. This, unfortunately, isn't something they are considering in the upcoming changes, and it's too late to propose they add it this round, but it is definitely something that could be added in the future. Mine is in my record and was found during an eye exam while I was on active duty. Spent numerous years working on the flight deck of an aircraft carrier in the bright pacific ocean sun. When you say covered do you mean like a rating of 0% or has there been individuals that have received something like 10%? What conditions would there have to be to receive a rating at all? I was told that it is highly recommend that I wear sunglasses outside and wear because of it. You are correct that pinguecula is rarely rated very high (although even a 0% is good in that medical treatment is covered and if it worsens in the future the rating can easily be increased). In extreme cases, it could cause blurred vision. In most cases, however, it wouldn't rate higher than a 0%. Do you know if these recommend changes were implemented or if the old ratings are still valid. Not implemented yet. We'll update the site as soon they are. How many times does a veteran has to have an incapacitating episode? Does it have to happen every year or can it happen just once in a veteran’s life time? I had a major eye injury in Germany while conducting mount training. I had an artillery simulator blew up in my face and damaging my right eye causing scaring and near vision lost in 1992. I spent over a week in the hospital in Germany and about another 6 months back in Italy, my duty station, going to the optometrist twice a week for treatment and testing. Does that count as an incapacitating episode happening only once or does an incapacitating episode have to happen every year? Thanks in advance! Your injury does count as numerous incapacitating episodes (each visit to the doc for treatment), however, the ratings require the episodes to have occurred in the last 12 months. Ratings are for long-term symptoms, not things that have been treated and cured, so the ratings are usually only for the current time period.